Australian euthanasia campaigner Philip Nitschke has been arrested at Auckland airport for bringing in copies of a handbook advising people how to take their own lives. His partner and co-author of the Peaceful Pill Handbook said his arrest was a surprise, as he had only taken the book to New Zealand to resubmit it to the country's chief censor Bill Hastings. Fiona Stewart told ABC: We actually submitted it for classification last year at about this time, it was banned in June and it's only now that he's had the chance to get back to New Zealand to give it another go. The handbook, which offers advice on assisted suicide, was banned in Australia last year. In June last year, New Zealand's Office of Film and Literature Classification gave the handbook an "objectionable" rating. Nitschke, who had also planned to hold a series of workshops on euthanasia while in New Zealand, said police had detained him on arrival at Auckland Airport, and that he had been read his rights. 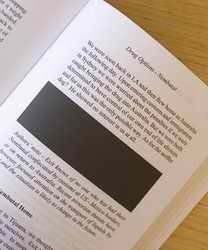 He said he had in his possession two books about euthanasia that had pages blacked out, and that the books had been seized. Earlier this week, Nitschke sought advice from the chief censor on the screening two videos - The Single Shot and Doing It with Betty - which are banned in Australia. Hastings said Nitschke emailed him on Tuesday seeking censorship advice. Hastings said he had offered advice on what grounds were required for the films to be shown without requiring a classification. He said it was for Nitschke to decide whether the films were exempt but he risked prosecution if they were shown and found to have required classification first. Customs officials released Nitschke after questioning him at Auckland Airport. An Australian euthanasia campaigner is now allowed to bring a modified version of his banned book into New Zealand. Philip Nitschke was detained at Auckland Airport when he arrived on Thursday night. Customs officers seized two copies of his DIY suicide guide. But he says the copies he brought in have been altered to appease New Zealand's chief censor, after the book was banned in February last year. Dr Nitschke says a detailed explanation was given as to why it was not allowed in the country. He says offending passages have been removed, and the book will be reviewed again by the censor. Philip Nitschke says there is a good chance the new edition will find its way into New Zealand book shops. Customs officers are to return items seized from euthanasia proponent Dr Philip Nitschke. A euthanasia book containing graphic descriptions of ways people can kill themselves is set to go on sale in New Zealand within weeks after a ban was lifted on Friday. Australian euthanasia advocate Dr Philip Nitschke had resubmitted The Peaceful Pill Handbook to the Office of Film and Literature Classification with sections blacked out after it was banned last July. Chief censor Bill Hastings told the Sunday Star-Times that the revised book could be sold to people over 18, but it had still been classed as objectionable. It must be sealed and have an R18 label on its cover before it can be sold in bookshops. Nitschke, head of Exit International and the 214-page book's co-author, lauded the decision and hoped it would prompt a rethink by Australian authorities which banned it last year. The decision is sure to be controversial. Pro-life group Right To Life claimed in its submission to Hastings that the revised book's contents were an incitement to suicide. The group was worried the book would fall into the hands of young people and those who were depressed or suffering serious mental illnesses. When Hastings first banned the book, his decision highlighted parts needing to be deleted because it told readers how to break the law. It included advice on how to avoid detection if assisting a person to commit suicide and on importing Nembutal, the common name for pentobarbital, a drug used by vets to euthanase pets. It is illegal to import and possess the class C drug in New Zealand without medical approval, but has become popular in euthanasia circles as a "peaceful pill" to end someone's life. The revised edition contains about 15 partially or completely blacked out pages but still contains graphic details about how to commit suicide, including how to travel to Mexico to buy Nembutal, which some New Zealanders have done. It canvasses suicide methods, including how to make lethal concoctions. It contains various diagrams and photographs, including a table comparing eight suicide methods, rating them from 1-10 depending on certain factors, such as reliability and peacefulness. Hastings said it was a well-intentioned book that advocates law reform and gives advice to enable the seriously ill and elderly to make carefully considered and fully-informed decisions about their own life and death. As repugnant as some members of the public may find the open discussion of voluntary euthanasia, suicide methods and the law, the New Zealand Bill of Rights preserves the author's right to freedom of expression and to impart the information and opinions contained in the book in its present revised form, his decision said. However, it noted the book's clinical accounts of meticulously planned suicides by various methods could make self-inflicted death appear acceptable, even desirable, and its rating of suicide methods could encourage readers to believe death could be achieved without undue suffering to themselves, the prospect of which may previously have acted as a deterrent. The nutters of the Society for Promotion of Community Standards has written to New Zealand's Film and Literature Board of Review, seeking a review of the approval of the book for R18 release. The society's executive director David Lane says the material breeds a culture of death in New Zealand and is not just a matter for the chief censor to deal with legally. Lane says the society is seeking an assurance that those who deal with depressive and suicidal people have been consulted over the release of the book. He says there will be calls for bookshops to be publicly shunned, should they stock the title. Pro-life organisation, Right to Life, says it is incongruous that on one hand we have this dangerous book being allowed for sale in New Zealand and on the other hand we have the Government earlier this year unveiling its five-year plan that includes expensive TV advertising to reduce New Zealand's suicide rate. Right to Life's Ken Orr questioned why the Government was not prepared to challenge the chief censor's controversial and dangerous classification . His society will seek a review of the misguided classification. A euthanasia campaigner's book outlining ways in which people can kill themselves could be banned for a second time if an appeal from pro-life advocates is upheld. The appeal by Right to Life New Zealand has stalled distribution of Philip Nitschke's The Peaceful Pill Handbook to bookshops, expected this month. Right to Life spokesman Ken Orr said the group had been granted permission by the secretary of Internal Affairs to make a submission to the Film and Literature Review Board after chief censor Bill Hastings approved the book for sale last month. It was given an R18 classification and must be sold sealed. Orr said the board had been asked to issue an interim restriction order so the book could not be sold till the submission had been heard: We're quietly confident that the board will agree with our submission and classify it as objectionable and have it banned. The book would now not go on sale till after a conference called Voluntary Euthanasia Matters run by Exit International in Christchurch on July 5. Australian euthanasia campaigner Dr Philip Nitschke has welcomed a decision by New Zealand authorities that will allow him to sell his controversial book in the country. Nitschke said he was heartened by Friday's decision to reject an application from pro-life groups, who wanted to stop the distribution of the Peaceful Pill Handbook. Earlier this month, the Society for the Promotion of Community Standards, and Right to Life New Zealand sought a fresh order restricting its distribution. The decision by the OFLC had demonstrated the open attitude of New Zealand to the important question of censorship," Nitschke said in a statement today: New Zealand's approach to censorship stands in stark distinction to the approach taken by the government in Australia, where the book remains a banned publication. Pro-life groups trying to stop a euthanasia book from going on sale are vowing to fight on despite their latest efforts being rejected. The Film and Literature Review Board declined last week requests by Right to Life and The Society for the Promotion of Community Standards for interim restriction orders on Australian euthanasia campaigner Philip Nitschke's Peaceful Pill Handbook. The order would have stopped distribution to New Zealand shops till a review of chief censor Bill Hastings' decision to allow its sale was heard. Both groups are seeking a review of the decision in which Mr Hastings allowed the sale of the book to over-18s. A hearing is set down for August 25. David Lane, executive director of The Society for the Promotion of Community Standards, said the group would apply for another restriction order. Right to Life spokesman Ken Orr said he was disappointed by the decision. The group would present a submission to the August hearing asking that the book be deemed objectionable and be banned. Dr Nitschke, founder of pro-euthanasia group Exit International, said copies would be available at a Christchurch conference on July 5 before being distributed to bookshops: We are thrilled the injunction has been turned down. It gives us till August to get the book distributed. Australian euthanasia campaigner Philip Nitschke could be hit with a fine of up to $NZ10,000 for publicly showing a euthanasia film in New Zealand that has yet to be classified there. Part of the short film, in which an elderly woman teaches individuals how to use an oven bag to end their lives, was played to about 50 people attending a public meeting on voluntary euthanasia held by Nitschke in Dunedin. The film is banned in Australia and could run foul of New Zealand's censorship laws. It is one of a series of three films called Doing It With Betty which describe the steps involved in taking their own lives using helium and a plastic bag. Nitschke said he had shown the films in public in Australia without rebuke since the recent change in government, but had only ever shown stills from the film in New Zealand. However, the film was available online. Chief censor Bill Hastings said Nitschke risked prosecution if they were shown and found to have required classification first. 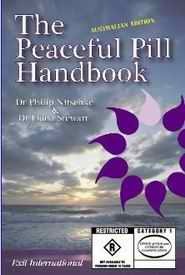 A censored version of The Peaceful Pill Handbook by Dr Philip Nitschke was awarded an adults only R18 certificate in May 2008. It has just had the R18 reconfirmed by the Review Board, who dismissed a challenge brought by the Society for the Promotion of Community Standards and Right to Life New Zealand. The author Dr Philip Nitschke has said the decision clears the way for a fresh attempt to get the book classified so it may be published in Australia where it is currently banned outright: We are talking to our Australian lawyers about lodging a copy of the New Zealand edition of the Handbook with the Australia Office of Film and Literature Classification, making use of the detailed the arguments outlined by the New Zealand Board of Review to justify re-classification here. Conway Hall, 25 Red Lion Square, London, WC1 (tube: Holborn). 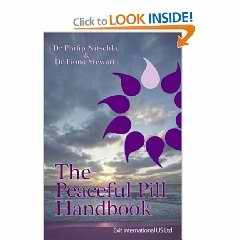 The digital edition of The Peaceful Pill Handbook will be launched. In attendance will be the President of Exit International US, Mr Neal Nicol along with a representative from the UK company providing the technology platform. Exit will hold its first UK Public Meeting, inviting discussion on the changing status of the important social issue of Voluntary Euthanasia and Assisted Dying. Exit International Director, Dr Philip Nitschke, will outline why he believes every rational, elderly or seriously ill adult should have access to information detailing the best means of an elective peaceful death and explain how this can be achieved. The Information Workshop will follow immediately from the public meeting and will develop in more detail the issues outlined at the public meeting. The aim of the Workshop is to enable participants to develop a personal end of life strategy for the future . Attendance at the workshop is free for Exit members. Non-members may attend upon donation (eg. £20). New members will receive Exit's newsletter Deliverance (6 months). An Australian doctor was banned from holding a workshop on how people could end their lives. Dr Philip Nitschke, who has been nicknamed Dr Death, had planned to hold a session on euthanasia in Bournemouth next week but the owners of his first and second venue choices, the local council and Hermitage Hotel, cancelled his bookings. Dr Nitschke chose the Dorset town because of its large elderly population. His workshops cover the merits of a helium exit bag , Mexican drugs, morphine and peaceful pills . He will host a session in central London on Monday and said he hoped to still be able to speak in Bournemouth on Thursday. The pressure group Dignity in Dying attacked the way Dr Nitschke ran his sessions, saying it was irresponsible and potentially dangerous to provide information on how to end life without safeguards or control over where the information goes. It said terminally ill adults should have access to better care and treatment, and the option of an assisted death within legal safeguards. Dr Nitschke said the ban on his workshop would deny people access to the best information on euthanasia: Elderly people want access to good information. It empowers them, they have a better quality of life and paradoxically they live longer because they have the peace of mind of an exit strategy. A book by euthanasia campaigner Philip Nitschke, Killing me softly , could be banned in Australia after a Classification Board hearing expected to take place next week. Dr Nitschke said Attorney-General Robert McClelland had referred the book to the board. The board's decision to hold a classification hearing is unusual, given Penguin Australia published the book more than three years ago. It is understood the Attorney-General was reacting to newspaper reports that a Perth mother, Erin Berg, who committed suicide in May after travelling to Mexico, had read the book, which describes euthanasia drugs sold overseas. Mrs Berg was suffering from serious post-natal depression but was not inflicted with a terminal illness. The Classification Board has the power to ban the book altogether, restrict its sale and distribution, or make it a crime to sell or display it. The chief censor, Donald McDonald, contacted Penguin Australia earlier this month and asked the publisher to submit a copy of the book that was written by Dr Nitschke and his partner Fiona Stuart. Dr Nitschke, who was on his way back to Australia from Britain after establishing an on-line site for his controversial The Peaceful Pill Handbook , said Mr McClelland was reacting to pressure from what he claimed was a campaign being organised by the family of Mrs Berg. 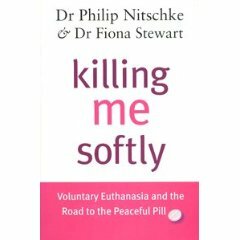 The book Killing me Softly has about one sentence referring to the fact that people go overseas to obtain euthanasia drugs, Dr Nitschke said, the book was largely a discussion of the issue and had been used in school curriculum. Penguin Australia publishing director Robert Sessions said any ban on the book could cause significant disruption. There were few copies of the book in bookstores and the ban would mostly inconvenience libraries. Following the May suicide of Perth woman in Tijuana Mexico, her sisters claimed she had used the book Killing Me Softly as a guide to end her life. They wrote to the Federal Attorney-General Robert McClelland calling for it to be banned. In October the Donald McDonald contacted Penguin, the publisher, and called it in for rating. This has now resulted in the book being awarded an Unrestricted rating. A last minute pull-out by Grand Central shopping centre management has caused a public meeting organised by euthanasia proponent Dr Philip Nitschke to relocate and given Toowoomba the distinction of being the only town in Australia to withdraw a booking made by his Exit International organisation. An angry and disappointed Dr Nitschke said he was astonished by the decision. Dr Nitschke said the only reason given was that he was a controversial figure and therefore inappropriate to be speaking at the community room at the shopping centre. Hitting out at the decision, Dr Nitschke said censorship of what could and couldn't be discussed in a public forum shamed Australia. It is a coincidence indeed that the venue should pull out on the day after we ran an advertisement in the Toowoomba Chronicle advertising the public meeting, Dr Nitschke said: Centre management knew what it was about and the booking was made weeks ago. New Zealand's Office of Film & Literature Classification have banned Dr Nitschke's suicide video. The decision was made on 24 November 2008. The decision followed a written complaint against the video by Right to Life New Zealand made on 26 June 2008 and by nutters of The Society for the Protection of Community Standards. The video was titled The Peaceful Pill: Single Shot. The video described how to manufacture the drug Nembutal. The Censor stated in his judgment; that the film promotes and encourages criminal acts by making them seem a completely normal and positive part of everyday life. Any use of the film as a basis on which to manufacture a drug said to induce a peaceful death is more likely to cause a violent injury or death by accident. Right to Life is disappointed that the Chief Censor has rejected a similar complaint against the suicide video, Doing it with Betty . The decision states that the film is classified as unrestricted. This video demonstrates how a person may commit suicide with a plastic bag. The Censor in his decision stated that; The innocuous nature of this film's content is unlikely to make its unrestricted availability injurious to the public good. Right to Life challenges this decision and will seek permission to have the decision reviewed by the Classification Review Office. It is understood that Dr Nitschke proposes to produce a further 14 suicide promotional videos. It is the intention of Right to Life to challenge these videos at the appropriate time by presenting a written complaint with the Office of Film and Literature Classification. Australian euthanasia activist Dr Philip Nitschke has been banned from four Irish venues during a European tour of his controversial right-to-die workshops. The director of Melbourne-based assisted suicide group Exit International had earlier been detained in France on his way to Britain during the tour. While Dr Nitschke has faced problems booking venues before, he says the level of opposition he's faced in Ireland is extraordinary. He said the cancelled bookings were due to church pressure rallied in a well-orchestrated campaign of censorship as he sought to educate Irish people on voluntary euthanasia. I fully respect the Church's right to hold their opinions but I take issue with those who try to ram their opinions down the throats of non-believers and people who elect to reconcile their faith with their right to know about safe suicide, Dr Nitschke said. The workshop has since been rescheduled at Seomra Spraoi in Dublin. Commercials Advice (CAD), the watchdog set up by Free TV Australia to classify and approve television commercials, has banned another pro-euthanasia commercial for promoting suicide. According to YourLastRight.com, the group behind the ad, CAD banned the spot for failing to comply with regulation 2.17 of the Commercial Television Industry Code of Practice. Section 2.17.5 of the code stipulates that realistic depiction of methods of suicide, or promotion or encouragement of suicide is unsuitable for broadcast . Neil Francis, chairman and CEO of the YourLastRight.com campaign, told Crikey the ad was rejected despite receiving preliminary commercial approval from CAD. The only thing that they [CAD] advised us of the airing time — that it should not be on during children's programs and of course we would have no interest in airing during those periods, Francis told Crikey. The 30-second commercial, which was due to air this Sunday on the major commercial networks, has instead been uploaded to YouTube in the hope it goes viral. YourLastRight.com brings together all Australian dying-with-dignity and voluntary euthanasia societies to deliver choice and dignity to Australians. We won't force our opinion on anyone but nor do we want to have our rights limited by others' beliefs any longer. For decades most Australians have believed that medically assisted dying should be a fundamental right. Today, 85% of Australians* agree but the timidity of politicians means that legislation still lags behind the will of the people. No longer. Millions of Americans, Belgians, Dutch and Swiss now have this right to choose to end their lives in a controlled, peaceful, dignified way – why not us?